Last fall Doug Lemov and the Teach Like a Champion crew ran a PD on Checking for Understanding 2.0. A huge part of this technique is creating a “culture of error” in class and embracing mistakes as part of the learning process. As part of creating a culture of error in class, one of the most essential skills teachers develop is “managing their tell.” As teachers we all have our stock responses when students give a wrong answer – and they know that we know that it’s wrong even if we don’t say it. All of these “tells” cut off valuable learning opportunities and ultimately diminish a student’s willingness to take risks and participate. I manage my tell these days by collecting many answers – even if the first or second is correct – and then have students explain which one works and why. Creating a culture of error in a history classroom carries special importance, as there are shades of correct answers and the thinking behind the conclusion is often more important to me for CFU purposes than the answer. As part of this year’s World War II final assessment, I incorporated a question on John Brown’s legacy from Beyond the Bubble. I wanted to get a sense of students’ ability to contextualize and apply their knowledge about the 1930s to a topic that, at first, could appear unrelated. As part of the deep excavation needed after grading the test, I asked the class to “annotate the source for context” – they translate these instructions into the historical analysis question “what was going on in the world when this document was created?” As I circulated I saw a range of answers – from correct and most relevant to correct to wrong. I collected their answers with the simple question “anything else?” all while expressing no opinion on the answers’ merit. Student participation was incredibly high as students took chances and we compiled a list of answers. I then asked students to tell me what they thought about our collection of answers. The first comment suggested we remove “World War II” and “Holocaust” from the collection of answers, as technically, neither was in full effect by 1936. From the remaining list we could move to author’s purpose and analyze the potential motivations for writing a play about John Brown and current events in the 1930s. The move of collecting answers on the board creates huge opportunities for discussion and increases student participation. Once the answers are on the board they merely become potential ideas to talk about and are depersonalized – no longer connected to one student being “right” or “wrong”. Students are more inclined to take risks and add their ideas to the collection. I then have the opportunity to circle back around to students who may have had a misunderstanding or were not able to explain, in the end, how these events may have been related. 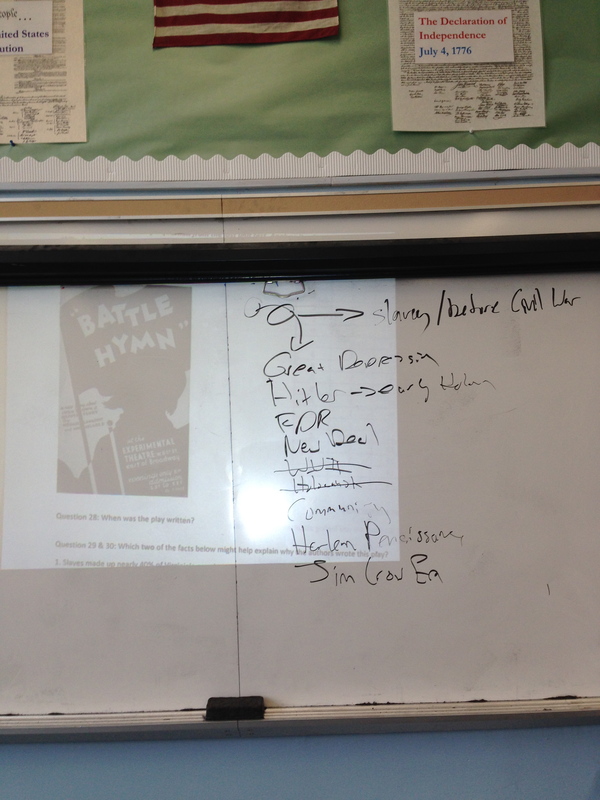 This entry was posted in Assessment, Teaching and tagged history, teaching, TLAC. Bookmark the permalink.